Mount Saver quart concentrate makes 2.7 Gallons. Are you finding insect damage on your priceless hunting trophies? Are you finding insect parts or material that looks like sawdust in or around your mounts? Are you a professional taxidermist and receive calls about insect damage? Are you a taxidermist who wants to expand your business? Do you know there is a naturally based solution to stop insect damage? Mount Medix has the answer. The first naturally based product to eliminate insect infestation in taxidermy. 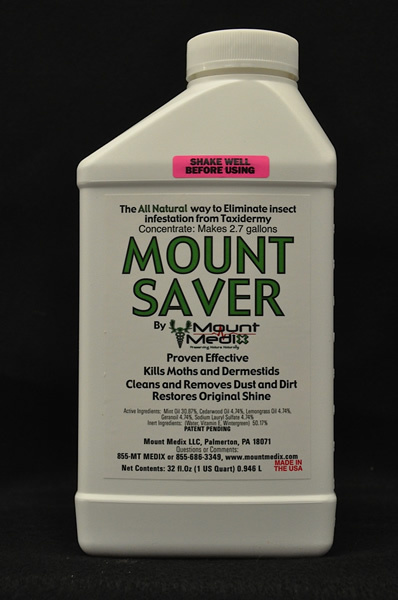 Mount Saver is a product created specifically for the taxidermy industry to effectively eliminate the insects, which infest the mounts and cause damage. 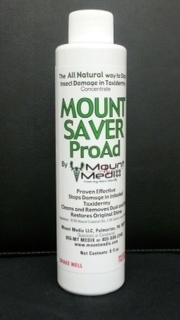 Mount Saver can be purchased and applied without a pesticide license. Mount Saver is easy to use, leaves behind a pleasant odor, and will clean and remove dust and debris from the mounts. It is safer and less damaging than using dangerous pesticides often used by exterminators lacking taxidermy knowledge. Mount Saver is available in convenient Ready to Use or more economical concentrate for larger jobs. Both forms are available in quart and gallon sizes.